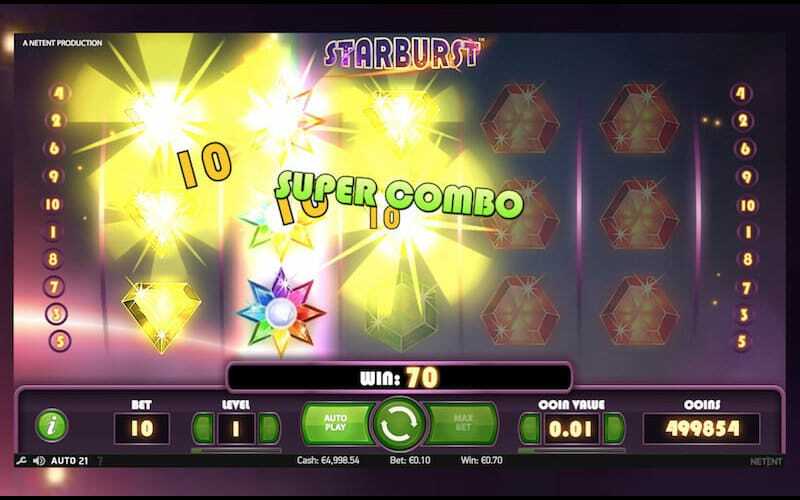 Starburst if a perfect name for this bright and vibrant arcade style game. Watch as the dazzling gems burst onto your screen with cosmic sounds and stunning graphics showering your screen in beautiful jewels. Take your pick between autoplay and manual spins, and watch the 5 reels spin out beautiful gemstones in eye catching green, purple, yellow, red and blue against a celestial background, in one of the most beautiful themes in casino slot gaming. Along with the traditional number 7 and Bar symbols giving you the bigger payouts, this simplistic but stunning slot game has everything to make it one of the most popular casino slot games out there. The wins will really get the adrenaline pumping with the super sonic sounds and flashy bursts will have you feeling out of this world here at Mega Reel. I am sure that NetEnt needs no introduction to any avid online casino gamer who play slot games in the UK, but for those newcomers that are interested to learn more about the slot game giants here is a quick rundown. Established in 1996 and based in Sweden and Malta, NetEnt has produced some of the most popular and revolutionary online casino games out there, changing the face on the online slot industry one game at a time. Offering anything an online gambler could want, progressive jackpots, impressive visuals and easy to use setups, makes NetEnt the best in the business. With over 200 colourful games to choose from including Blackjack Roulette, Video Poker, Craps. How many stars are there in the night sky? Do you ever look up and wonder what amazing things take place among the planets. Stars have always inspired us to dream, ranging back to ancient sailors that would use the stars as a map to guide them to untold worlds. To the Greeks that looked up and saw their Gods victories painted out across the night sky above them. What dreams do you have when you look into the stars? In this dazzling casino slot the stars could well bring you fortune. Let’s take a look at how it’s played. 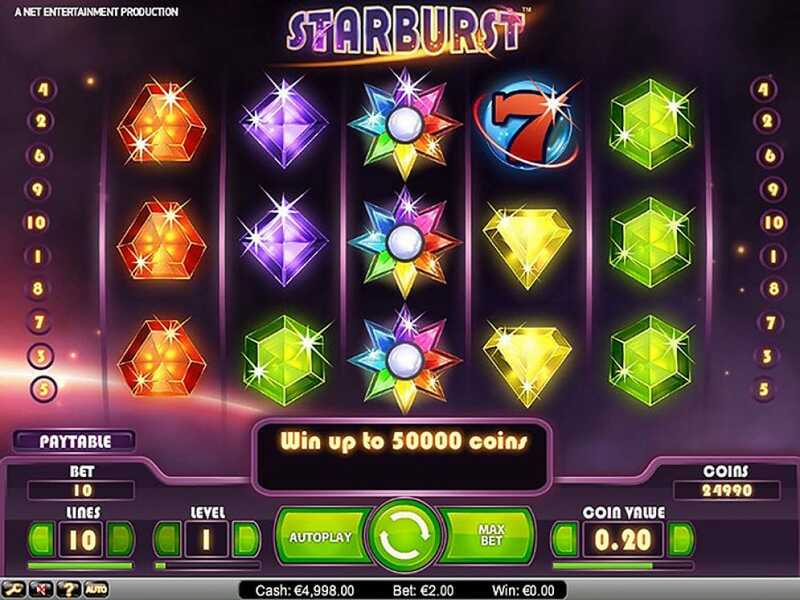 Starburst slot is a 5 reel, 10 payline game of pure pleasure and the option to Play-Both-Ways allows you to play from left to right and vice-versa doubling your chances of a big payout that is out of this world. If you’re ready to travel through space to win big then check out what’s to offer with this amazing game. ●The biggest star in this sky is the Starburst symbol. The brightest and most colourful of them all. ●If this appears on reels 2, 3 or 4 then it will expand to cover the entire reel making the whole reel wild for that turn and the next one. ●These include the sparkling red, blue, green, yellow and purple gemstones along with the traditional 7 and bar symbols. An extremely fun and vibrant online slot game with the possibility of astronomical wins, no wonder it remains one of the most popular casino slot games to play today. If you loved the cosmic theme and want to write your future in the stars then be sure to check out some other top hits from NetEnt slots including Cosmic Eclipse and Dazzle Me. If you liked this, you will also love Star Quest!